So there’s definitely been a sort of jerky craze going on in my world lately. Andy and I started playing around with making our own back in January when I was doing the 21 Day Sugar Detox. Then all of the sudden I started noticing more and more jerky companies in the stores and it seemed everyone around me was making it too! 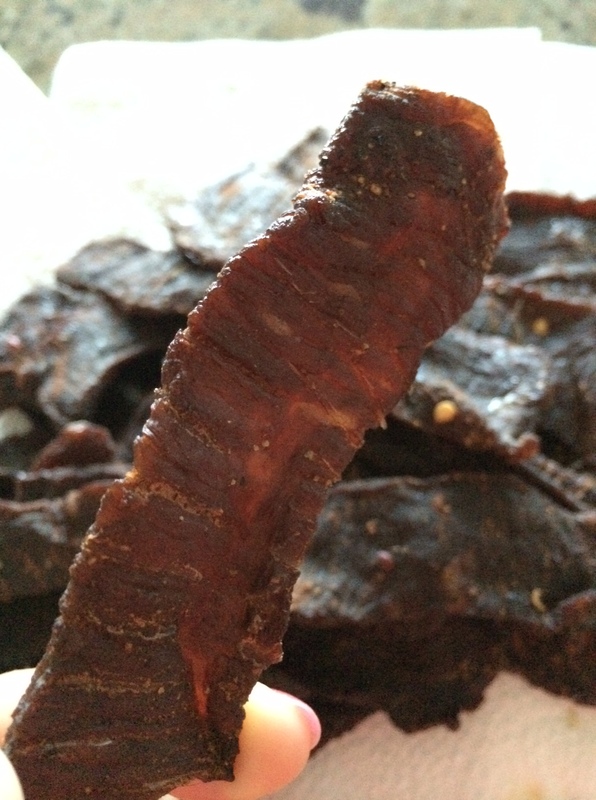 So I’ve basically been trying a ton of jerky over the past 6 months…and will say I like ours the best! 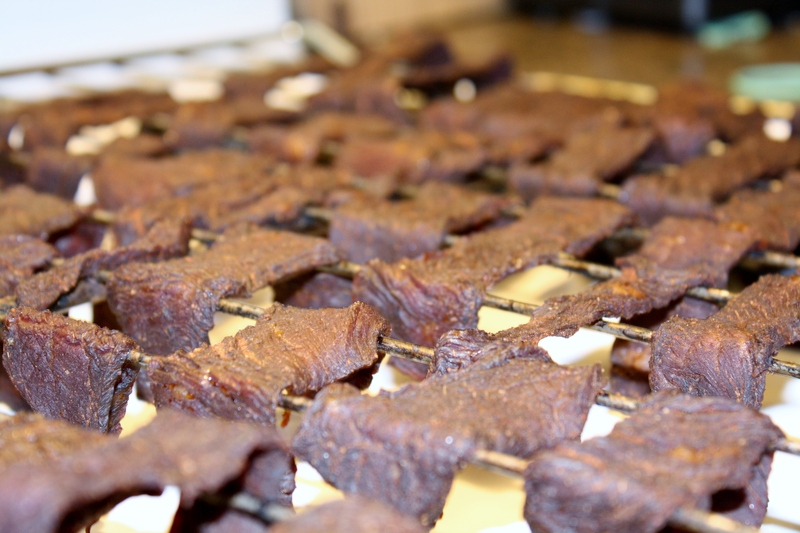 Since more and more people have been asking how the heck we make this healthy, great for paleo snacking jerky, I thought I’d share our method. We started out doing it in the oven. Yup that’s right you can do it right in your very own oven! In our new house we have a gas stove and I just wasn’t comfortable leaving it on for an extended period of time so we bought a dehydrator. Once you get your meat home place it in the freezer for about two hours (possibly longer depending on the thickness of your meat). This makes it much easier to cut even pieces of jerky. Take the meat out of the freezer. Start by cutting off any big pieces of fat you see on the edges. 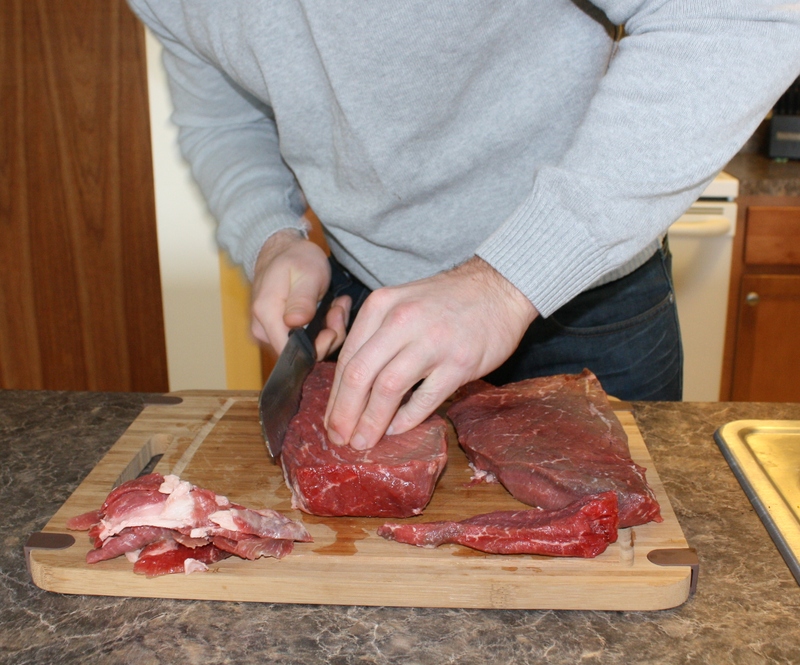 Then take the piece of meat and cut it against the grain in to quarter-inch thick slices. Place your slices in a zip lock bag with your marinade. I don’t want to reveal what we use for a marinade quite yet. Danielle from Against All Grain has a good one though. Leave the meat marinating anywhere from 4 to 24 hours. Preheat oven to the lowest temperature it goes, preferably 175 degrees. Line the bottom of your oven with tin foil. Take the rack out and place each piece separately on it. Place the rack back in and shut the door with a wooden spoon in between keeping it cracked open slightly. This is key! We forgot to do it once and it ruined the batch. Let the jerky dry out in there for two and a half to three hours. There you have it! 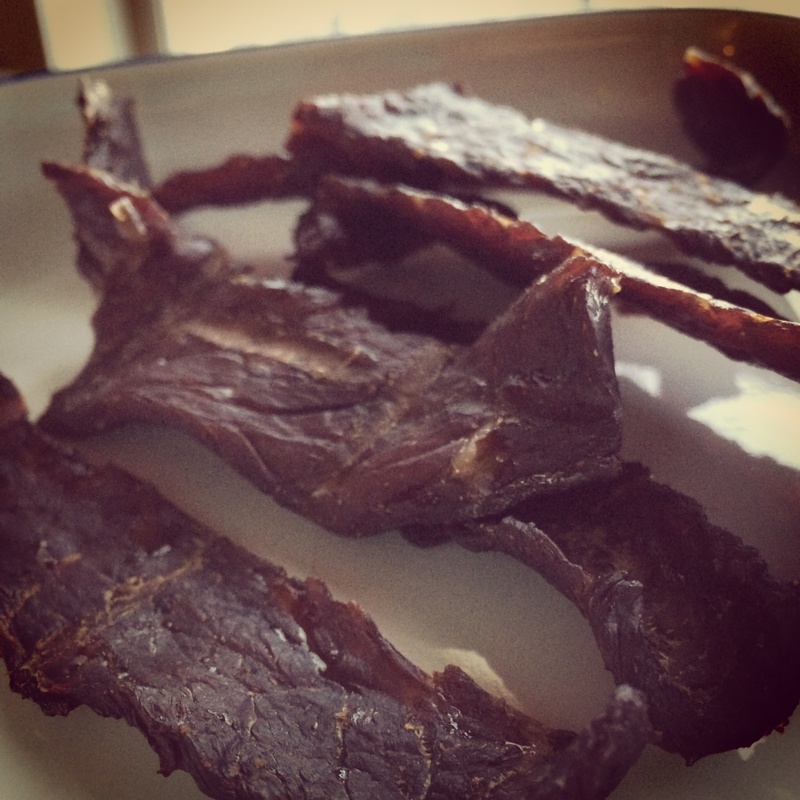 Beef Jerky is an awesome paleo / primal snack. If you make it at house with a natural, healthy marinade it’s so much better for you than store-bought brands! 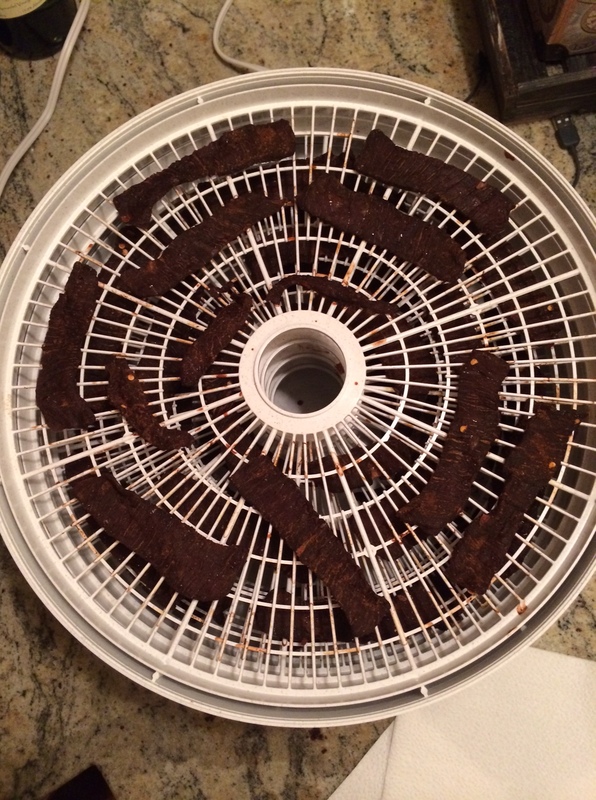 We’ve got a Nesco dehydrator too, and I love making jerky in it! Though it’s been quite a while since I’ve broken it out. It seems to be the go-to dehydrator. I love it it’s so easy! Looks so good! The oven method seems a bit too drawn out for my incredibly impatient self so it looks like we’re going to have to get ourselves a dehydrator. Now if only I could figure out where to store it in our tiny NYC apartment haha! Thanks for sharing the instructions, I’ll definitely be trying this!